The Berlin International Film Festival is nearly upon us (Feb 6-16), unveiling an 18-strong line-up for its Berlinale Special strand, including nine World Premieres. Two stand-out World Premiere's specially highlighted this year are A Long Way Down, starring Breaking Bad’s Aaron Paul and Pierce Brosnan, and The Two Faces of January, the directorial debut of Drive screenwriter Hossein Amini starring Viggo Mortensen, Kirsten Dunst and Oscar Isaac. Having created the title sequences for both, we couldn't be any happier. And excited to see both films getting a great reception. A Long Way Down, is an adaptation of Nick Hornby’s bestseller about four people who meet on New Year’s Eve and form a surrogate family to help one another weather the difficulties of their lives. It stars Breaking Bad’s Aaron Paul, Pierce Brosnan, Toni Collette and Imogen Poots. The Two Faces of January, is a con artist thriller from the director of Drive Hossein Amini, which stars Viggo Mortensen, Kirsten Dunst and Inside Llewyn Davis’ Oscar Isaac. It's been a while since we last blogged about, and completed the titles sequence for John Michael McDonagh's new film 'Calvary'. But we are absolutely delighted to see the exclusive new trailer released on Twitter this week through the film's official profile @CalvaryFilm. Additionally we see the film has announced its' World Premiere at next years Sundance Film Festival, which we very much look forward to seeing. Sundance celebrates its 30th anniversary in 2014, having introduced global audiences to some of the most groundbreaking films of the past three decades. The festival starts on Jan 16 and runs through to the 26th at Park City - Utah. 'Calvary' is a black comedy-drama, telling the tale of Father James Lavelle (Brendan Gleeson), a good-natured priest intent on making the world a better place who is continually disheartened by the spiteful inhabitants of his small country town. When his life is threatened during confession, he is forced into battle with the dark forces that start to close in on him. All images and clips shown here remain the property of their respected owners. Copyrights apply. I'm excited today to be at Screen International's launch of the 2013 UK Film Summit in association with the British Film Institute (BFI). Today is a one day industry conference at BFI Southbank's NFT1, which is expecting to see more than 300 industry attendees. The Summit will primarily focus on the UK film industry and its place within the worlds market, looking at opportunities for the industry in the future. Many experts and keynote speakers will be taking part in todays event, including British Film Commission's Iain Smith (Wanted, The Mission, The Killing Fields) and Slate Films' Andrea Calderwood (The Last King of Scotland, A Most Wanted Man) - who we had pleasure in creating the title sequence for their latest film 'Half of a Yellow Sun', which is due for release next year. Ben Roberts (BFI Film Fund) and DJ Films' Damian Jones (The Iron Lady, Belle) also join the impressive list of panellists, addressing the challenges in film finance; development of audiences in the UK and how distributors and exhibitors can adapt to the digital world; the UKs place in the global market, amongst many other areas to conclude on how the film world can benefit from convergence in our multi-platform world. The day is looking to be very interesting as well as a good opportunity to discuss and share views with other film professionals. For those that are coming, I look forward to seeing you there. The programme for the 57th BFI London Festival launched today with exciting news of the films screening this year and those that are running in competition. With a number of films featuring which are fresh from both the Toronto and Venice festivals, having already wowed audiences and gained glowing reviews. This years event is already looking like it's going to be a great feast of viewing splendor. Having created the title sequence for one of those films 'Half of a Yellow Sun', we are delighted to see Biyi Bandele's new film screen back here in London as part of the BFI's Strands and Pathways 'Dare' category. And my dear friend Stephen Frears' film 'Philomena' starring Judi Dench and Steve Coogan screen as part of the Sponsored Galas. The festival programme is again organised into focused categories that are formed around the themes of Love, Debate, Dare, Laugh, Thrill, Cult, Journey, Sonic and Family. An approach designed to help festival goers to find the films they want to see and also expose to new audiences. The festival will screen a whopping total of 234 features, combined of both fiction and documentary films. Which include 22 World Premiere's, 16 International Premiere's and 29 European premiere's. London's film festival has never had it so good... with Director Paul Greengrass' new film 'Captain Phillips' starring Tom Hanks opening the festival, and who commented at the official launch saying "The British film industry has never been better, with the best filmmaking talent in the world now regularly coming to London to make movies". He's right too... now is a great time for movie making, not just for the British film industry, but filmmakers all around the world. 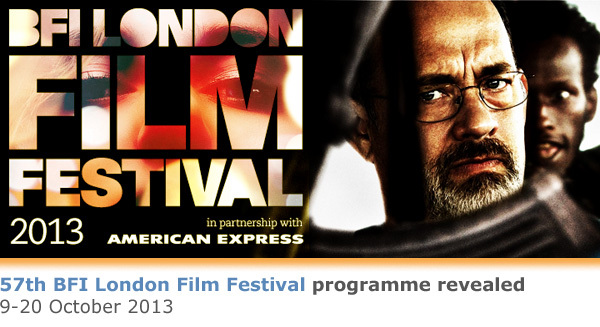 And the timing for the BFI's annual event couldn't be any better. Venues across the capital, from the West End Cinemas to the central London venues, including the Odeon West End, Vue West End, Odeon Leicester Square; which recently we attended for the World Premiere of Morgan Spurlock's One Direction film 'This Is Us', Curzon Mayfair, Ciné Lumière and this years new addition the Cineworld Haymarket, will be screening all of the films during the 12 day event. And we can't wait for it to get going. In addition to all the film screenings. Special Events, Screen Talks and Master Classes will take place during the festival. With attendances to Gala Screenings by key talent such as: Paul Greengrass, Tom Hanks, Barkhad Abdi, Faysal Ahmed, Barry Ackroyd, John Lee Hancock, Emma Thompson, Alison Owen, Stephen Frears, Judi Dench and Steve Coogan, Steve McQueen, Chiwetol Ejiofor, Alfonso Cuaron, David Heyman, Sandra Bullock, Joel & Ethan Coen, Carey Mulligan, Oscar Isaac, Ralph Fiennes, Abdellatif Kechiche, Lea Seydoux, Adele Excharchopoulos, Alain Guiraudie, Joseph Gordon-Levitt, Alexander Payne, Lukas Moodysson. 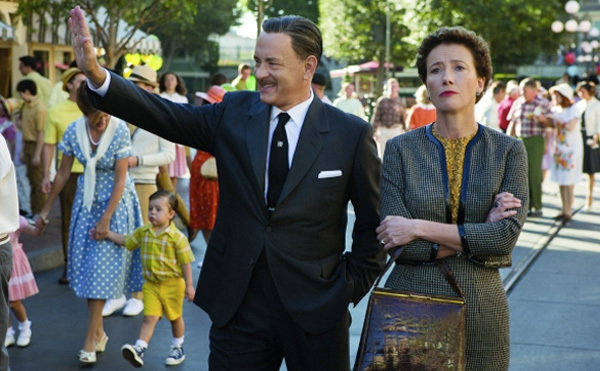 The final show will be the European Premiere of Disney's Saving Mr. Banks, which will close the festival continuing the initiative from last year with the Closing Night Red Carpet event and screening being screened simultaneously to cinemas across the UK. Hope you can all make it, and we look forward very much to seeing you there. All copyrights to images remain the property of their respective owners. Yesterday saw the long awaited World Premiere of Biyi Bandele's 'Half of a Yellow Sun' at the Toronto International Film Festival. The first of 3 screenings took place at the Winter Garden Theatre and was well attended by both stars and crew for one of the most anticipated films of this year. It was the first time ever for a Nigerian film to get a red-carpet screening at such a major event. British-born Nigerian actor Chiwetel Ejiofor (Inside Man, American Gangster) and Thandie Newton (Crash, The Pursuit of Happiness) lead the way down the carpet, along with other cast members Anika Noni Rose (Dreamgirls), John Boyega (Attack the Block) as well as Genevieve Nnaji and Onyeka Onwenu. Based on the award winning novel by Nigerian author, Chimamanda Ngozi Adichie, the film produced by Andrea Calderwood at Slate FIlms (Generation Kill, The Last King of Scotland) is screening again at Scotiabank 4 today and on Saturday. We look forward to hearing some great reviews from the festival and the films world release in November.